Next month, it will be time for my annual eye exam. I know it may not be exciting news to you. But, I look forward to spending about twenty minutes with the doctor that I've known since my final year of college. Dr. Robinson fitted me with my first pair of contact lenses - just in time for graduation. Wearing my new contact lenses, I had participated in the baccalaureate and graduation exercises blinking a mile a minute. Plus, I had the hardest time putting those lenses on my eyes. I would close them up and stick the lenses on the eyelids. Now, I am an old pro in putting on contact lenses, Back in the day, Dr. Robinson was slender in build with black hair pulled into a small pony tail and fresh out of ophthalmology school. Now, he has a little weight on his frame and his hair has turned gray. Since he is now a husband and a father of three, four or five, (I can't remember), Dr. Robinson sports a more conservative haircut. With this in mind, the doctor is quick to point out that I had a full head of hair when we first met. During one office visit after I had to experience that puff of air in both eyes and escorted to the exam room without my contact lenses, I sat in a comfortable leather exam chair. It reminded me of a chair from "Star Trek" or "The Jetsons." Before, I had gotten comfortable in the chair, I had studied the high-tech eye chart on the wall. I wanted the eye doctor to think that I now had 20/20 vision. He would have exclaimed, "It's a miracle!" After a few minutes, I heard a tap on the partially open door. Dr. Robinson peeked in and entered the semi-dark room. For a man as young as he, the doctor was shuffling like an elderly gentleman. "Why are you walking so slowly?" I asked after our usual pleasantries. "Well, do you remember that I bought a farm, last year?" asked Dr. Robinson. I replied, "Yes, I do." "This past Saturday, I was doing some yard work around the barn. Pulling weeds, mowing the grass and that sort of stuff. Then, I had to use the bathroom. The house was so far away, and I couldn't make it there in time. So, I went into the bushes and pulled "it" out and held "it" as I relieved myself. You know, I wasn't wearing gloves when I was pulling weeds. After that, I broke out in a rash with some swelling "down there," Dr. Robinson offered. "Really," I said in amazement. "Yeah, I went to the doctor because it was bothering me and "it" began to swell real bad. 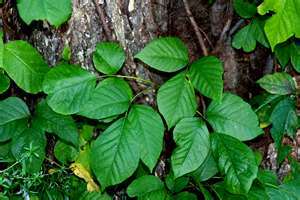 My doctor said that it's poison ivy! I have to put some cream on 'it' " he said. Trying not to laugh, I said, "I'm sorry to hear that. Your wife must be disappointed." "Not really. She's glad that it's now big and swollen," Dr. Robinson offered as a matter of fact. I laughed aloud at Dr. Robinson's last statement. He then said, "You know I saw you trying to memorize the eye chart on the wall. So, I have a surprise for you..."
Now, if I can get at least two nice comments this week, I will publish the rest of this blog post on Wednesday. Until next week...keep praising His name! You left me hanging dude. You and your opthy - TMI. But, no matter, I enjoyed your story. So does this count as one of the 2 nice comments required? If so, please proceed. I want to find out how the wise doc thwarted your plans to cheat the eye test.